Croajingolong National Park covers a vast area from Sydenham Inlet to the New South Wales border. 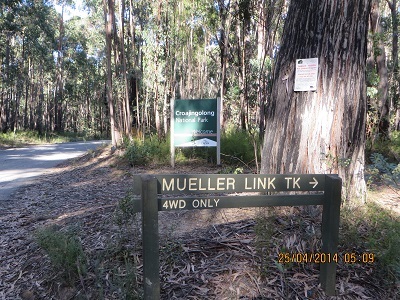 We visited the Park on Anzac Day and then we activated Alfred National Park. We had earlier in the day visited Coopracambra National Park on our way to Victoria from Narooma in New South Wales. We travelled the Monaro Highway to Cann River. It was a three park day! And very challenging. We chose to gain access to Croajingolong National Park via the West Wingam Road and soon after passing the park entrance we took the Meuller Track and set up on the edge of the track hoping no one would decide to visit! On our way along the West Wingam Road we were confronted by a person with a Stop Sign (or Lolly Pop). In conversation with this person it had transpired that the v-double log truck had lost its load on a wet and slippery corner. While the logs were not huge nor were they matches! I wouldn’t like to be on the receiving end of the load coming loose. We were able to continue on our way after a few minutes delay. The driver later told me that was why he was working on Anzac Day. 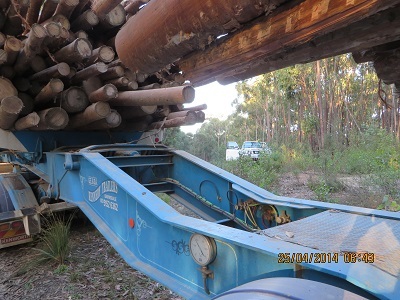 The picture shows the log truck on our return from the Croajingolong activation parked near the corner of Alfred National Park. I was impressed with the driver. When he saw our 4 x 4 parked near the Alfred National Park corner he stopped his vehicle and came over to see all was right with us. 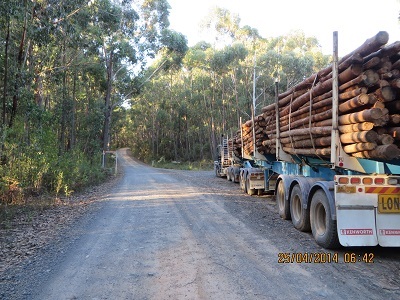 He had earlier parked the log truck for departure on the 26th April. As the Victorians will tell you these East Gippsland Parks are a long way from Melbourne and are not activated very often. In South Australia on 40 metres conditions are often poor and it is very difficult to copy QRP stations even from my home station where I experience very few problems with noise. I am hoping some Victorians will feel inspired to travel to East Gippsland and activate these magnificent parks. I need them all as a chaser! I began my efforts at 02:16 with a contact with VK3YY/P3, Glenn in VK3 VG 003, Mount Toorongo. What a great way to start the activation! Then followed VK3MTB, Tim; then VK3JNI, Philip at The Lakes National Park, VK3RAN, operator Luke; VK3PF/P3, Peter at VK3 VE 056; VK2IB/P3, Bernard at the same location as Peter; VK3FQSO, Amanda; VK3ZPF, Peter; VK2CCJ, Cliff; VK3ZPF, Peter; VK3BHR, Phil; VK3JD, John at Port Melbourne; AX2UH, Andrew at Yass; VK3MRG/P3, Marshall on VK3 VN 017; AX5PAS, Paul; AX2UH, Andrew; VK3FB/P, Len; VK3TKK, Peter; VK3HRA, Allen; VK3ANL, Nick on VK3 VE 019 and Mount Buffalo National Park, VK3MRO, Tibor; VK2LAX, Rod and, finally, AX2CL/P2, Raffy on Bear Island. I was very pleased to achieve 23 contacts well and truly activating the park for the VKFF award.